Playmates Toys has done another terrific job with the new Teenage Mutant Ninja Turtles series, both cartoon and classic. 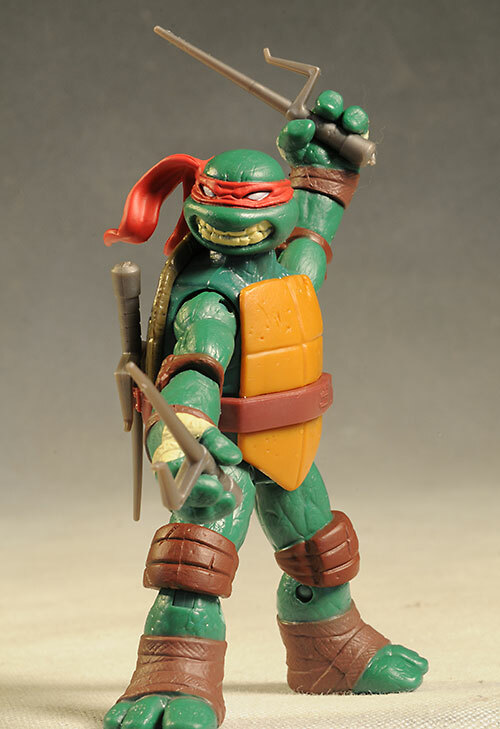 It's a crime, but I've only reviewed the classic and new cartoon Michelangelo figures so far, even though the series did extremely well in the Poppies for 2012. 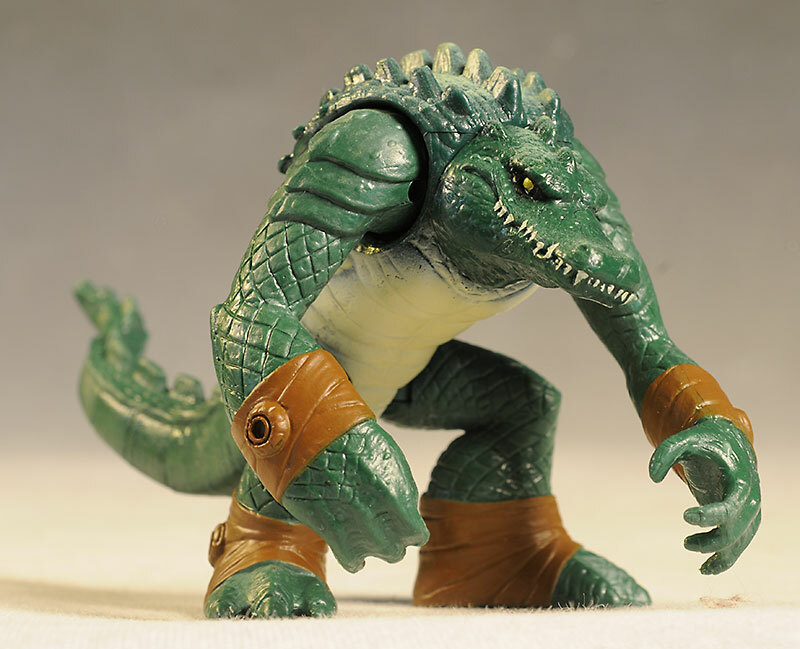 I'm looking at the new Leatherhead tonight, as well as the on going Raphael. Both can be had for around $9 at most major retailers. The packaging remains the same - colorful, well designed, and less wasteful than many others on the shelf. The odd shape of the card back and bubble makes them a tad hard to store and display for the MOCers, but openers won't care. One of the strengths of this line is the excellent sculpting. Both these figures look terrific, and do it without creating issues with the articulation or accessories. These figures run around 4 - 6" tall, depending on the character. 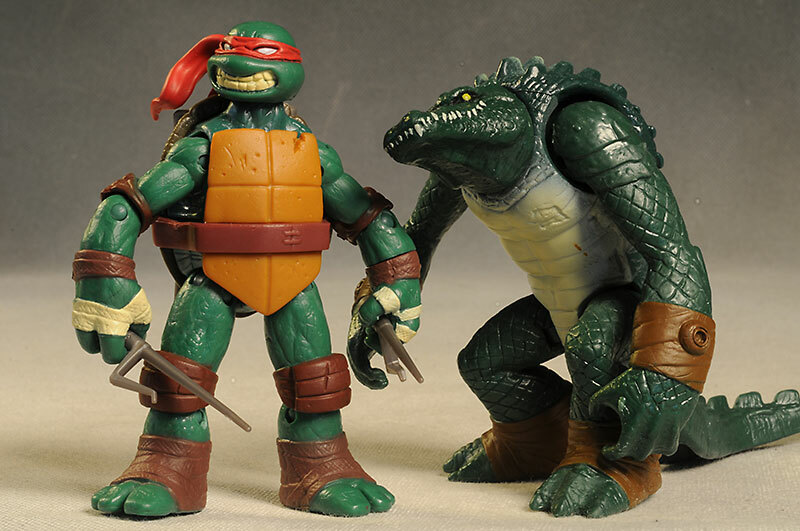 Leatherhead is on the small side at 4" tall, and Raph is actually another half inch taller them him, assuming you have him standing up straight. 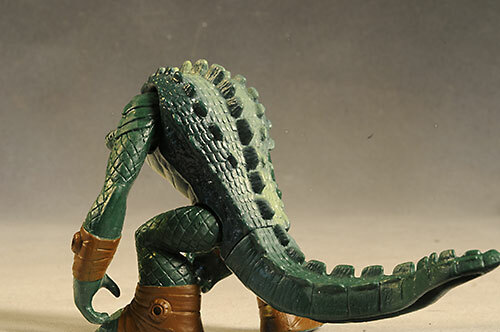 Both figures have sharply cut details, with just the right amount of texturing. They remain true to the cartoon style, but have been translated nicely into 3 dimensions. 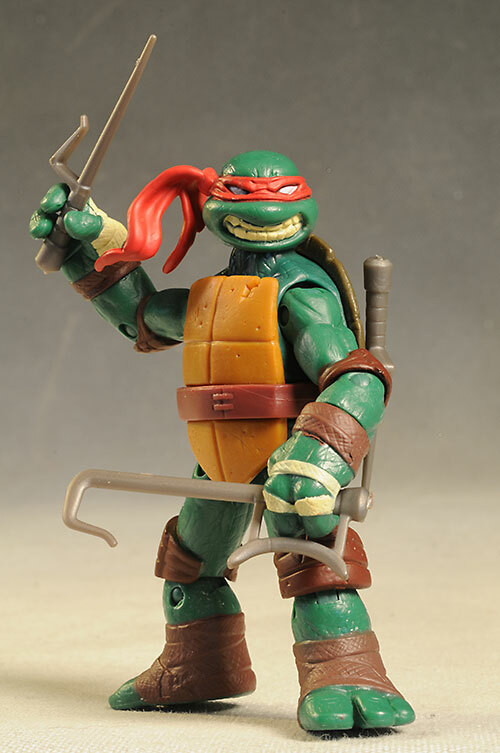 The hands on Raph are designed to work with the accessories, and both figures stand great on their own, always key when making figures for kids. 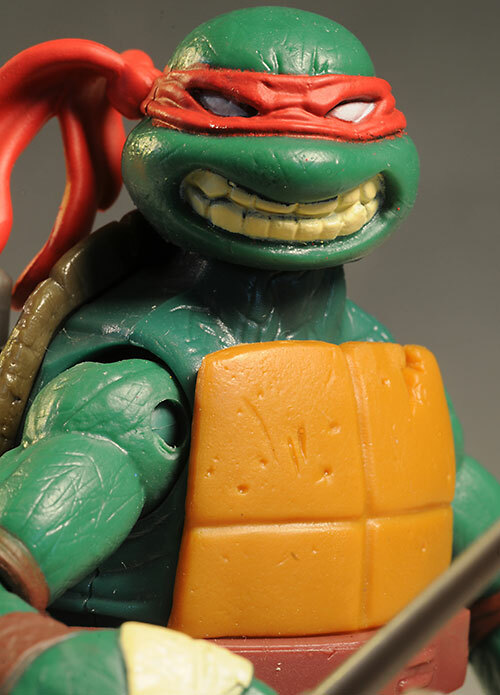 There are a couple minor nits that bug me about Raph's look, however. You know I'm not a fan of the double denture grimace, even on a cartoon character. Add in the silly wind blown dynamic look of the ties for his mask, and you get a slightly lower score. There's not a ton of paint ops on either of these figures, and they could use a few more. Still, what's here has clean edges and consistent colors. 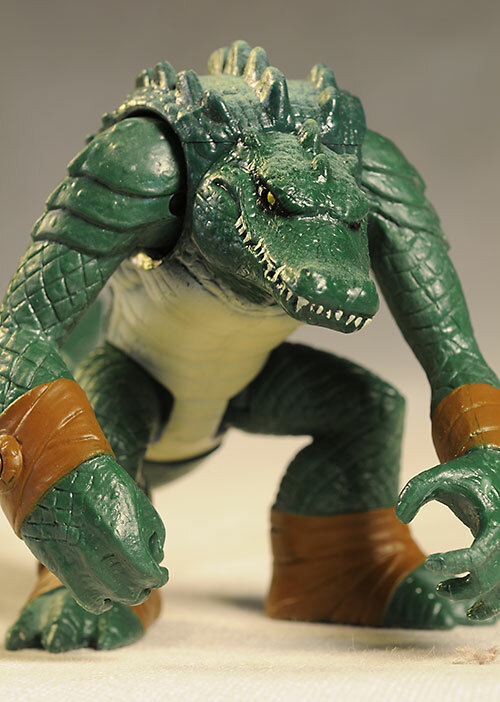 I particularly like the transitions between the body colors on Leatherhead, as well as the small, dangerous teeth. Most mass market figures these days are lucky to get the paint in the general vicinity of the intended location - it's nice to see decent quality at a reasonable price point. 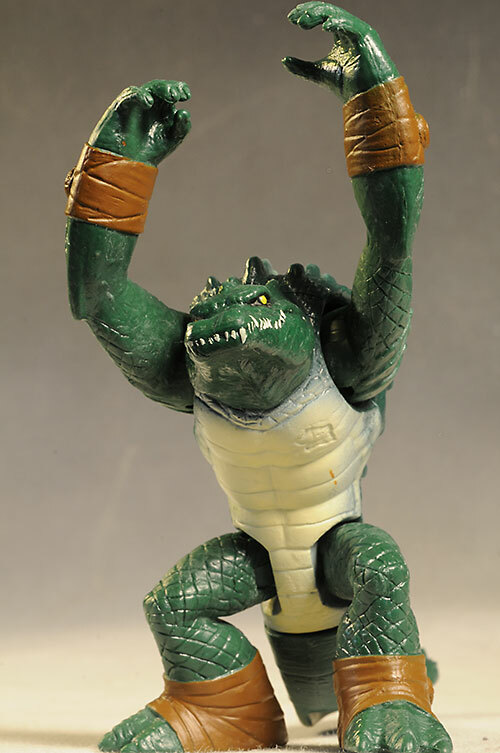 The main turtle characters are all very well articulated, able to take plenty of fighting stances. The other characters...not so much. 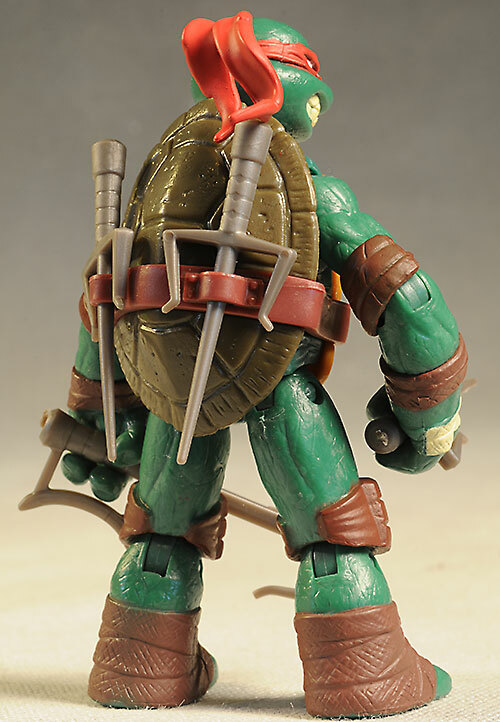 Raph has a ball jointed neck, pin/disc ball shoulders, hips, elbows, and knees, and cut wrists. They all work fairly clean, with just a bit of restriction due to the sculpt. 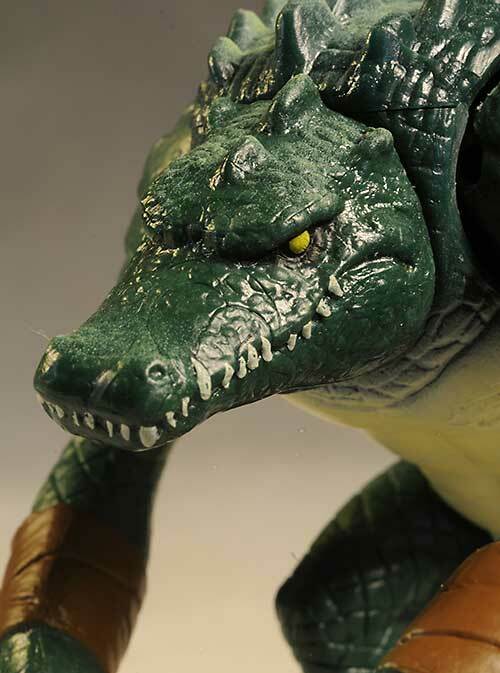 Poor Leatherhead doesn't fair quite as well. He does have a cut neck, hips and tail, as well as ball shoulders. While that's not a ton, you can still get a few decent poses out of him, and he stands great on his own. I don't think I've ever reviewed two figures so far apart in this category. Poor Leatherhead gets jack, zippo, nadda. Absolutely nothing. On the complete opposite end of the spectrum is Raphael, who gets not one or two weapons, but eight! They come in pairs, from stars to sais, all deadly and all wicked looking. You can fit a couple in the straps on his back, and his hand sculpts work with every one. They are only gray in color though, pretty basic stuff. They actually come still attached to the sprues, which is probably a cost cutting measure. If it keeps these guys under ten bucks, I'm all for it. I think these are the best action figures on the mass market pegs right now. While other companies have cheapened their releases with poor articulation and no accessories, Playmates has kept alive the tradition of great action figures, and done it at a price that's hard to beat. Kids will love these, and the proof is in the empty pegs at most retailers. 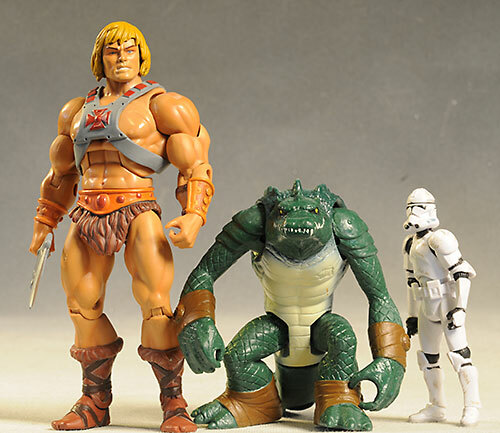 How many action figures can you buy for less than ten bucks these days? Not even most 4" figures are that cheap any more, and those have far less bulk and usually fewer accessories. Watch for a sale, and you can snag them for $8! I'm really loving this line, almost enough to take the plunge. 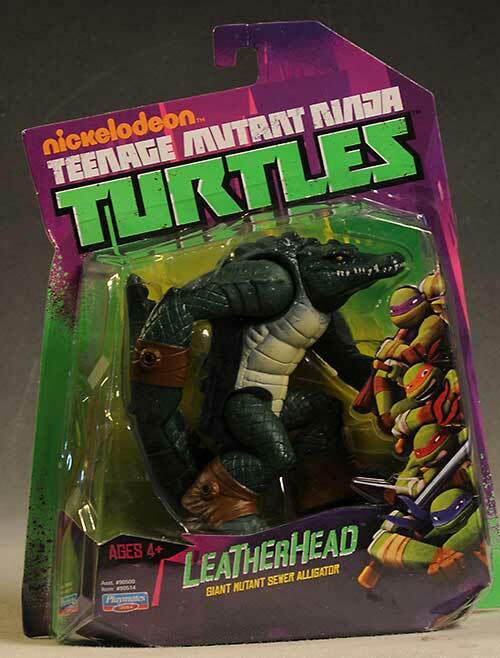 When I came across Leatherhead, I was ready to jump into the deep end and snag the rest of the releases so far...and then I checked half a dozen stores, and found nothing more than Donetello, Raphael, and Metalhead. These things are still really moving off the pegs. Playmates seems to have another hit on their hands with an old license that they are so very familiar with. At this rate, Playmates' Turtles is going to end up on even more Best Of lists for 2013. So what retailer has these on sale and in stock? I'm feeling a need for turtle power! Best bet is to hit up your local mass market toy sellers, like Toys R Us, Target and Meijer. Expect to pay around $9. I've looked at the classic and new Michelangelo, as well as the terrific series by NECA, Playmates movie versions, and more of the early 2000 toys.